The Eighteenth, Nineteenth and Twentieth Dynasties of Ancient Egypt collectively mark the New Kingdom. The latter two dynasties constitute an era known as the Ramesside period. The Twentieth Dynasty is considered to be the last one of the New Kingdom of Egypt, and was followed by the Third Intermediate Period. The Pharaohs of the 20th dynasty ruled for approximately 120 years: from ca. 1187 to 1064 BC. The dates and names in the table are mostly taken from "Chronological Table for the Dynastic Period" in Erik Hornung, Rolf Krauss & David Warburton (editors), Ancient Egyptian Chronology (Handbook of Oriental Studies), Brill, 2006. Many of the pharaohs were buried in the Valley of the Kings in Thebes (designated KV). More information can be found on the Theban Mapping Project website. 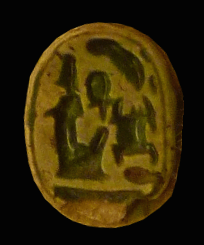 Pharaoh Setnakhte was likely already middle aged when he took the throne after Queen Twosret. He ruled for only around 4 years when he was succeeded by his son Ramesses III. Egypt was threatened by the Sea Peoples during this time period, but Ramesses III was able to defeat this confederacy from the Near East. The king is also known for a harem conspiracy in which Queen Tiye attempted to assassinate the king and put her son Pentawere on the throne. The coup was not successful in the end. 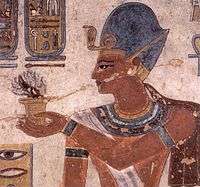 The king may have died from the attempt on his life, but it was his legitimate heir Ramesses IV who succeeded him to the throne. After this a succession of kings named Ramesses take the throne, but none would truly achieve greatness. The period of these rulers is notable for the beginning of the systematic robbing of the royal tombs. Many surviving administrative documents from this period are records of investigations and punishment for these crimes, especially in the reigns of Ramses IX and Ramses XI. As happened under the earlier Nineteenth Dynasty, this group struggled under the effects of the bickering between the heirs of Ramesses III. For instance, three different sons of Ramesses III are known to have assumed power as Ramesses IV, Ramesses VI and Ramesses VIII respectively. However, at this time Egypt was also increasingly beset by a series of droughts, below-normal flooding levels of the Nile, famine, civil unrest and official corruption – all of which would limit the managerial abilities of any king. The power of the last king, Ramesses XI, grew so weak that in the south the High Priests of Amun at Thebes became the de facto rulers of Upper Egypt, while Smendes controlled Lower Egypt even before Ramesses XI's death. Smendes would eventually found the Twenty-First dynasty at Tanis. The Twentieth dynasty of Egypt was the last of the New Kingdom of Egypt. The familial relationships are unclear, especially towards the end of the dynasty. 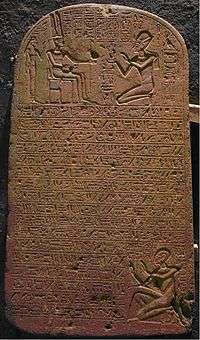 Sethnakht, took over the throne of Egypt after the death of Twosret. He also usurped her tomb, KV14 for his own use, and erased all her images and cartouches and replaced them with his. He also named several of his children after people related to Ramesses II. 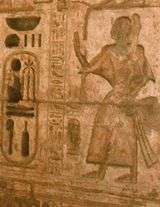 Here in this stela, he offers a statue of Maat to Amun. Ramesses III, was the son of Sethnakht. 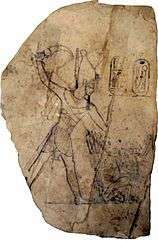 During his reign, he fought off the invasions of the Sea Peoples in Egypt and tolerated their settlement in Canaan. A conspiracy was hatched to kill him, but it failed. He was later murdered. 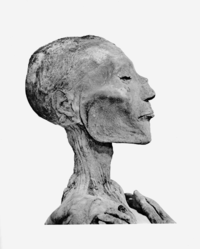 His mummy, long an inspiration for the scary Hollywood films, showed his throat was slit. Ramesses IV was the fifth son of Ramesses III. He assumed the throne after his four older brothers had died. 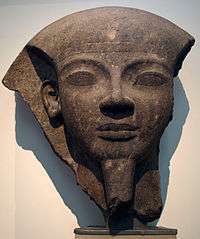 Ramesses V was the son of Ramesss IV and Queen Duatentopet. During his reign Libyan raiders attacked the country and attempted to conquer Thebes, forcing the workers of Deir el-Medina to halt work in the Valley of the Kings. He died of smallpox. Ramesses VI was an uncle of Ramesses V. He usurped his predecessors throne and later his tomb, KV9. 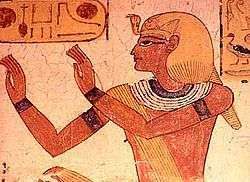 Ramesses VII was the son of Ramesses VI During his reign, prices of grain soared to the highest levels. His mummy has never been found but cups bearing his name were found in the royal cache at Deir el-Bahri. He was buried in KV1. Above is a scene from KV1, open since antiquity. Ramesses VIII, born Sethherkhepeshef, was a brother of Ramesses VI and a surviving son of Ramesses III. He may have ruled for a year or two. His tomb has never been identified. Ramesses IX was the grandson of Ramesses III, nephew of Ramesses IV and VI, and a son of Mentuherkhepeshef, who never became a pharaoh. Ramesses X, born Amunherkhepeshef, took the throne after Ramesses IX. He is a poorly documented king, with few monuments to his name. His tomb, KV18, was left unfinished. Ramesses XI was the last pharaoh of the twentieth dynasty. He begun KV4 but later abandoned the tomb. As Egypt weakened, Ramesses XI was forced to share power in a triumvirate with Herihor, the High priest of Amun and Smendes, governor of Lower Egypt. 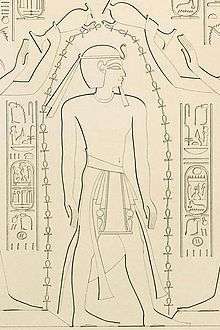 Ramesses XI was buried in Lower Egypt by Smendes, who later took the throne himself. Pharaoh is a historical novel by Bolesław Prus, set in Egypt at the end of the Twentieth Dynasty, which adds two fictional rulers: Ramesses XII and Ramesses XIII. It has been adapted into a film of the same title.